I’d like to start my first blog post EVER with a short story about what I’d like my entire blog to be about. This photo is of a stained glass window in my great grandpa’s old house. It’s not the greatest of photos, but it’s all that I have. I was probably six years old the last time I visited his house. Why am I writing about it? Well, because I remember it, above all else; it left an impression on me. 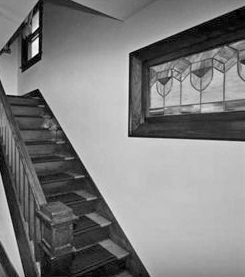 I remember very few things about the house, but I remember that stained glass window. I remember staring up at it and I thought it was absolutely amazing. Now, as an Architect, I try to design those sorts of special “moments” or “events” in the houses I design. Every house should have at least something special in it; a moment that is unique and personal. Something worth remembering that draws you from one space to the next. So, welcome to my blog! I don’t claim to be a wordsmith, by any means, but I’d like to share my ideas with you and hopefully help some of you along the way. I love this comment "Every house should have at least something special in it; a moment that is unique and personal. Something worth remembering that draws you from one space to the next. "